In 2009, the Ontario government’s Ontario Women’s Directorate launched the Neighbours, Friends and Families (NFF) campaign in communities across Ontario. This campaign raised awareness of violence against women in vulnerable groups across Ontario. 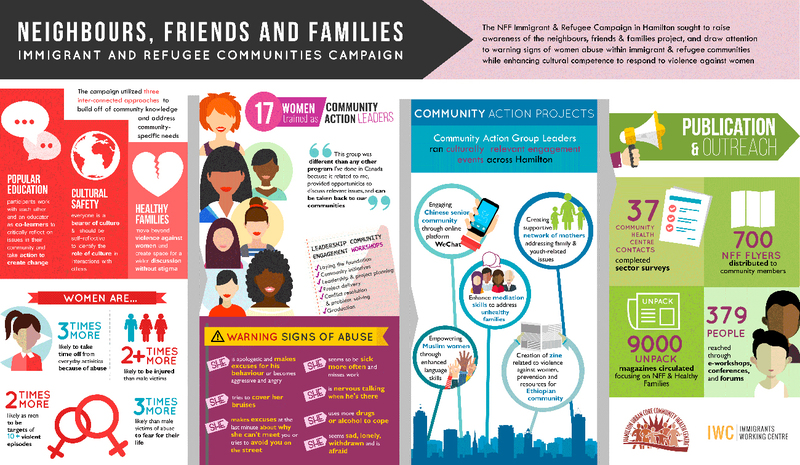 In Hamilton, Urban Core Community Health Centre worked with immigrant and refugee groups to talk about violence against women and what it means for their families and communities. Hamilton welcomed around 3,900 permanent resident immigrants from 2006 to 2011. Just over half of these immigrants were female and almost half of female permanent resident immigrants were between the ages of 25 and 44. Also, nearly a quarter of female permanent resident immigrants came to Canada as refugees. These women and their families come from around the world and add even more vibrancy and diversity to the city. Hamiltonians and many Hamilton organizations have welcomed newcomers over the years and helped them integrate into their new city. In order to engage with women about this sensitive topic, Urban Core used a unique approach to talking about violence against women. Instead of using the term “violence against women,” a taboo and private topic in some cultures, Urban Core focused on healthy families and what women feel makes a healthy family. 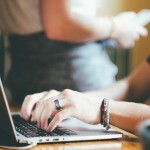 Women were able to recognize traits they felt contributed to the health of their families and could also talk about what an unhealthy family looked like. By talking about healthy and unhealthy families, Urban Core took a culturally safe approach to this sensitive topic. Violence against women is a topic loaded with history and prejudice; just using the term can insight anger and upset. In some cultures domestic violence is considered a family matter that no outsiders should be engaged in. By talking about healthy families, Urban Core could engage with women across cultures in a safe and supportive environment. Urban core tackled this issue in two phases. The first phase started in 2009 and raised awareness about the NFF campaign and engaged immigrant and refugee communities in discussions related to the campaign. This phase set the stage for the second part of the project. The second phase of the project was launched in 2014. It built capacity of community leaders and worked with them to create projects specifically for their communities. During this phase of the campaign, 18 women were trained to become Community Action Group Leaders and designed their unique initiatives. Using a popular education model to build off of people’s experiences, Urban Core provided six weeks of training to community leaders. In the second phase of the campaign, Urban Core also contacted other community health centres, sharing their experiences with the NFF campaign in Hamilton and encouraging other centres to take on projects like NFF in their communities. This campaign ended with a series of Community Action Projects designed by Community Action Group Leaders during Urban Core’s training. Leaders used social media platforms, language classes, a zine, and support networks to engage with their communities and talk about healthy and unhealthy families, and the services available for immigrants and refugees in Hamilton. Morganne King-Wale is the Program Development and Evaluation Coordinator at Immigrants Working Centre.